THURSDAY, 11:23am: The Hornets have officially signed Sessions, the team announced today in a press release. MONDAY, 1:36pm: The Hornets have landed a backup point guard, according to Keith Pompey of The Philadelphia Inquirer, who reports (via Twitter) that the team has agreed to sign Ramon Sessions. The two-year pact will be worth $12.5MM, a league source tells Adrian Wojnarowski of The Vertical (Twitter link). Rick Bonnell of The Charlotte Observer (Twitter link) pegs the exact value at $12.3MM. Sessions, 30, has bounced around the NBA since entering the league in 2007, playing for six teams over the course of his career. 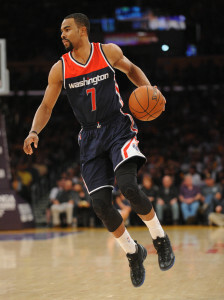 Most recently, the former second-round pick appeared in all 82 games for the Wizards last season, backing up John Wall at point guard. It was a solid year for Sessions, who contributed 9.9 PPG, 2.9 APG, and a.473 FG% during his first full season in Washington. In Sessions, Charlotte lands a backup at the point for Kemba Walker, and one that will come much cheaper than Jeremy Lin, who agreed to a three-year deal worth $12MM annually with the Nets. Sessions will earn about half that with the Hornets, on a shorter term, and his agreement will still leave Charlotte with a little leftover cap space to go shopping for a big man. Since free agency opened, the Hornets have also reached deals to bring back Nicolas Batum and Marvin Williams. Even then, a backup rim protector with Zeller/Kaminsky able to log the lion’s share of minutes at the 5.